On Friday 26th and Saturday 27th of August, Seomra Spraoi will be host to the first gathering of the No Borders network to take place in Ireland. No Borders campaigns struggle alongside those effected for freedom of movement, for the freedom for all to stay in the place which they have chosen, against repression and the many controls which multiply the borders everywhere in all countries. This gathering is working towards establishing a network of individuals and grassroots organisations within Ireland and abroad who are working on the questions of migrants and asylum seekers. 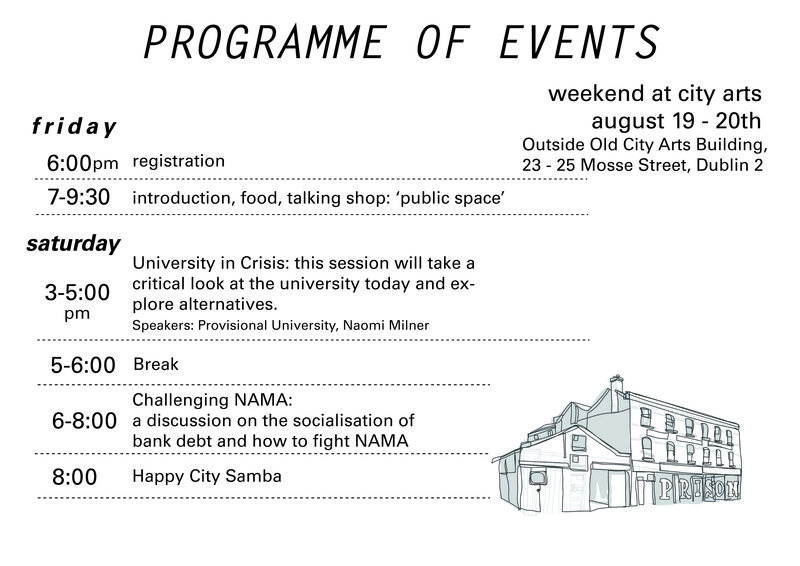 Come down to the Old City Arts this weekend (friday and saturday) to discuss public space, nama and the university! On Monday the campaign for the old city arts had an open meeting to discuss what we want to do with the building when we get it. Up until this point most of our energies have been channelled into the ‘campaign’. A large part of this process was meeting up with a wide variety of people to tell them about the campaign and gain their support. The hope was that by keeping the future open in terms of what we would do with the building a space would be created that could allow others to feel included, to put forward their own projects and desires. While this worked to some extent it was thought that we also needed to think about what we wanted, to remember that we were not just ‘campaign organizers’. Those who came to the meeting suggested what they were personally interested in doing with the building. There were several suggestions for educational projects that were explicitly in opposition to the forms of teaching and research that currently prevail in schools and universities. These included critical pedagogical and research methods that sought to learn from concrete, everyday experiences and problems, learning and researching with people rather than at distance; holding regular and ongoing courses on subjects that were not usually taught or available to people and workshops or collaborative projects, including, for example, a hacker space. Related to these projects was the idea of using the building as a resource or archive, such as a library, but including recordings or records of various events that took place in the building. Also as a place to generate publications, zines etc. A specific project called ‘Radical Love’ was proposed to take place from the 13th-15th September. This would take the form of an ongoing seminar involving up to 30 people presenting their various work. Following on from the recent emergence of people’s assemblies in North Africa, Spain and Greece, and now in Ireland through Real Democracy Now, it was suggested the building could be used to hold regular and ongoing assemblies for people in the city. There are not many indoor spaces in the city where this kind of event can happen. The assembly would be a place for people to meet, to voice their problems and angers but also a way to generate political projects. Other suggestions were more general in terms of how the building could be a place to support other projects: a roof garden or community garden; a cafe; language classes. The question arose again, a question which had defined the discussion from the start: how much was the building to be defined by us and our desires and how much by others? On one hand it was argued that it is more important to fight with people than fight for them: that it is better to put forward our own problems and needs in the hope that they will resonate with people rather than setting up a building to ‘facilitate’ other people. On the other it was argued that the building could quickly turn into another ‘independent space’ which was full of ‘our’ creativity and desires but had no impact politically in terms of creating some sort of counter-power to the state and market. The danger in this situation is that the building becomes another ‘island’ with no concrete support from beyond its limited circle, no political potency. In order to become a stronger force, more than just a building, requires strong connections of solidarity to be formed with other communities and individuals around the city. Rather than being two opposing sides a common idea is that there needs to be something concrete and real in our demands for the building (something more than just getting an empty space) but these demands need to be universal not just specific to us. But there has been a concrete demand that has resonated with people from the beginning: a frustration and anger at the way our collective lives are being constantly undermined and destroyed by a present and future ‘reality’ which the government and other ‘experts’ tell us is unavoidable. The campaign for the building came out of this anger, and a desire to do something to challenge it- by claiming a building. This anger has the capacity to resonate. Autonomy was suggested as a term or concept that seemed to encapsulate much of what we had been talking about. Autonomy from an ideology that tells us we can’t do anything on our own: whether that be a ‘reliance’ on state funding (community development, arts, university) or a ‘reliance’ on keeping the market happy (austerity, commercialization of education). The building is an assertion of our autonomy. Within it people can pursue what they want as an expression of this political statement of autonomy. This seemed to overcome the problem of labeling it ‘educational’ or ‘cultural’ or ‘social’ which can, especially now, tend to be generic and meaningless. At the same time autonomy can suggest ideas of self-reliance which is the opposite of what is intended in terms of the building being part of the generation of a real, concrete counter-power in the city and country. But concepts are not static. Having a term like autonomy at least allows us to develop some common understanding of what we are doing, or feel we are doing. We ended by deciding to hold a series of events over three days at the end of August (Thursday, 18th- Saturday, 20th) outside the building. These events would be a demonstration of the things we would like to see happen in the building. By doing something, with people, we also leave the comfort, and sometimes frustration, of only thinking in meetings. 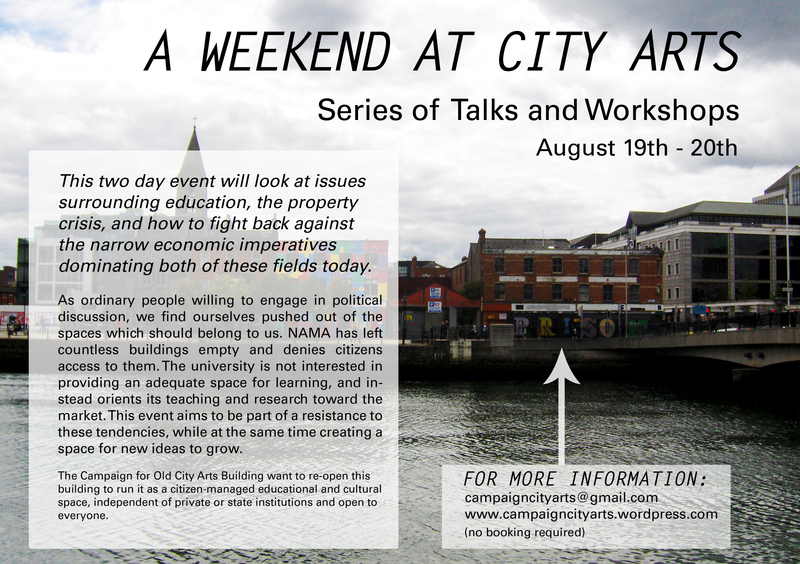 If people have ideas for the three days please come along to our weekly meetings, Mondays at 6pm in Seomra Spraoi, or else email campaigncityarts@gmail.com. 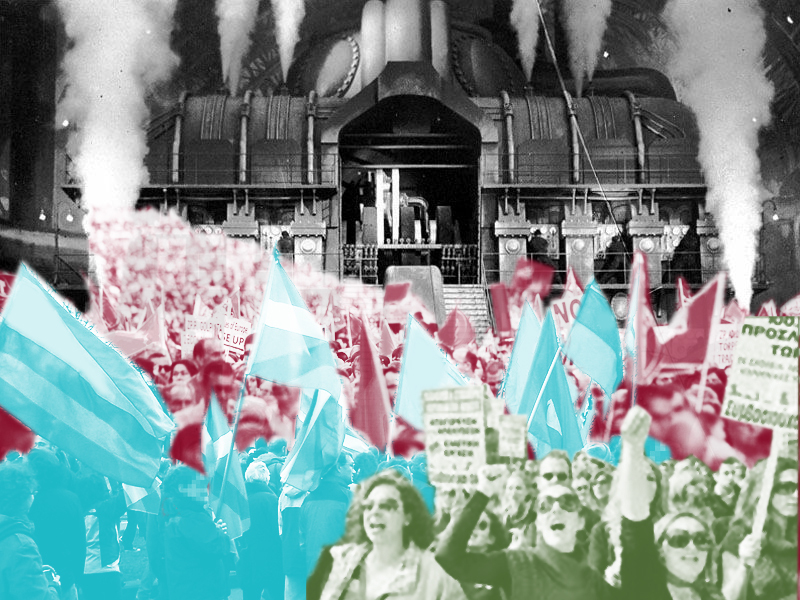 The two suggested texts, which should provide a starting point for discusion, are David Graebers ‘Debt: The First Five Thousand Years’ and the recent Documentary by Katerina Kitidi and Aris Hatzistefanou called ‘Debtocracy’. The Graeber text gives a breif history of debt from an anthropological point of view, conecting its inception to a history of slavery and state sanctioned violence. The documentary focuses on Greece’s particular crisis in the context of the recent history of IMF and World Bank intervention. 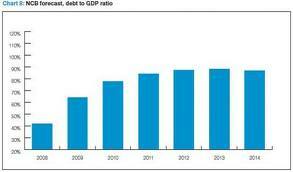 Particular highlights are an explanation of the concept of ‘odious debt’ and Equador’s unorthodox handling of their sovereign debt in 2006.